We've been playing around with the Galaxy Nexus, and we know you out there are just about to get your hands on yours, but there are some tips and tricks to help you with the new Android 4.0. Our first tip is for Face Unlock. Face Unlock is the newest gimmick feature to hit mobile phones. It pushes along the grand tradition of features like Face Time, which look really cool and are sure to impress people, but don't have a lot of practical real world use. Face Unlock isn't very secure, we confirmed that it will easily be fooled by a picture, and there is another slight trouble with the feature: it hates facial hair. 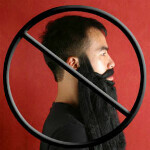 Face Unlock will likely still work if you have a beard or mustache, but it will be a lot more finicky, and have more trouble recognizing you, especially if you haven't trimmed your beard in a while. Face Unlock is very fast and easy when it does work, but it's probably a good thing that ICS is being released after Movember. At least Google has another year to tweak Face Unlock before the next barrage of facial hair. Would be interesting to see the improvements to this. My guess is the future is a progressive face unlock, like it records an update to your face everytime you unlock it so as your hair grows it can adjust. Or it scans your retina and a fingerprint. in general, it uses the size, shape and position of your eyes, nose and mouth, which is why someone who looks like you could hack it. I guess it uses color differentiation between skin and features, so facial hair causes problems. I don't see why they haven't implemented a fingerprint unlock feature. Wouldn't it be incredibly easy with capacitive technology? Breaking news: shave before you unlock. "Face Unlock is very fast and easy when it does work, but it's probably a good thing that ICS is being released after Movember." Did you mean November?